A studio dropping currently on the Scraps CD. MPEG-1, Layer 3, 160 kbps, 44.1khz audio. 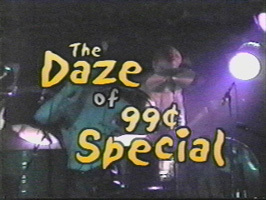 Recorded 1993-1995 and released on Intentional Overdose in 1995. 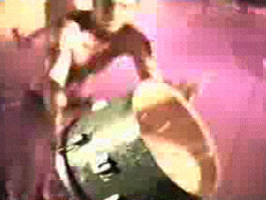 MPEG-1, Layer 3, 128 kbps, 44.1khz audio. Video Game for Amiga computers. A drum machine for the Commodore 64 using digitized drums (digis as they were once called, or sampled these days). This was the first drum machine used in early 99 tracks. Music tracking program used to create the 99 songs. This is an early version, there is a modern version available at medsoundstudio.com. 29.97 FPS, 304x232 pixels, 16-bit 44.1khz audio. High quality video of 'Dying For' from the beginning of one of the best 99 shows. 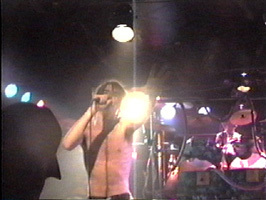 Recorded at the Water Street Music Hall in Rochester, NY. 29.97 FPS, 304x220 pixels, 16-bit 44.1khz audio. 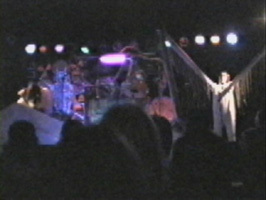 'Cog' as it happened during the emotional break down of the final performance in 1996. 29.97 FPS, 320x240 pixels, 16-bit 44.1khz audio.